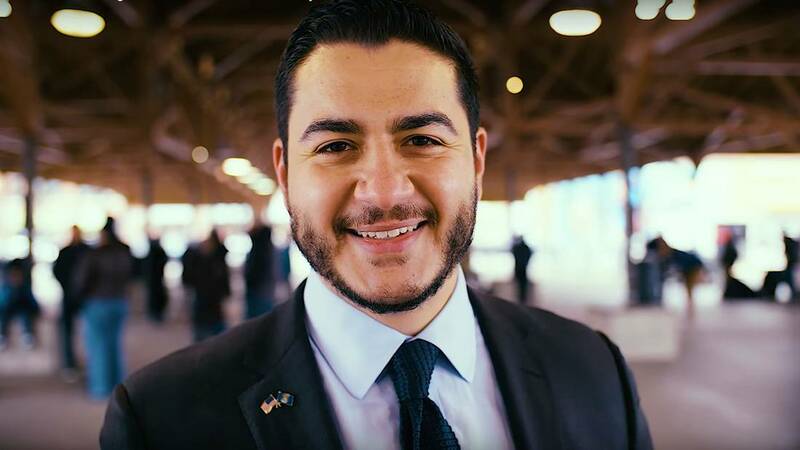 A Bridge Magazine report raised questions about whether Democratic candidate for Michigan governor Abdul El-Sayed is eligible for the race. State Democratic leaders are urging El-Sayed to get a ruling from a court about his candidacy. The Michigan Democratic Party is calling on gubernatorial candidate Dr. Abdul El-Sayed to ask a court to decide whether he meets eligibility standards to be on the ballot. Three days after Bridge Magazine reported El-Sayed’s eligibility could be an issue because he was a registered voter in New York as recently as 2015, Michigan Democratic Party Chairman Brandon Dillon issued a statement Thursday saying the report raised so many questions the candidate should resolve the issue in court. “We are calling on Dr. El-Sayed to take appropriate legal action, including asking the courts for a ruling on his eligibility as soon as possible,” the statement from Dillon read. El-Sayed, former director of the Detroit Health Department, said this week he is “100 percent” certain he can be on the ballot, and that questions about his eligibility are a smear campaign, laden with hints of racism, from establishment Democrats. His campaign produced statements from a campaign lawyer, former Federal Election Commission Chairman Robert Lenhard, saying El-Sayed is eligible, and calling the questions a "red herring." On Thursday, El-Sayed spokesman Adam Joseph issued a statement saying the campaign will "take whatever step necessary to put these shameless political attacks to rest." He didn't respond to requests to elaborate. El-Sayed registered to vote in 2003 in Michigan as a teen, but then registered and cast a ballot in 2012 in New York,where he completed his medical studies and began an assistant professorship at Columbia University’s Mailman School of Public Health in New York. Public records show he was a registered voter in New York as recently as 2015. El-Sayed re-registered in Michigan in 2016 and did so with a New York driver license, according to Michigan Secretary of State records. Michigan, however, never canceled his voter registration, even during his absence. Five election lawyers told Bridge that El-Sayed could have trouble proving he was a qualified elector in Michigan because of his New York voter registration. He called on El-Sayed to follow the lead of Krish Vignarajah, a Democratic candidate for Maryland governor, who asked a court last fall to confirm her eligibility for office and whether she meets eligibility requirements. She voluntarily withdrew the lawsuit this week and is still running for governor. It was not immediately clear which court El-Sayed would approach, if he were to follow the party’s advice. El-Sayed is polling second behind former Senate Minority Chair Gretchen Whitmer but ahead of businessmen Shri Thanedar and Bill Cobbs. El-Sayed, the son of Egyptian immigrants and a Muslim, has likened eligibility questions to the so-called birther movement that sought then-President Barack Obama’s birth certificate. It’s been a response that’s drawn support from some of his supporters nationwide but also some sharp criticism, even from progressives such as Electablog, a progressive political blog which called the El-Sayed’s accusations “shockingly offensive hyperbole” in a post earlier Thursday. In its original report, Bridge reported that many Democrats are privately waiting to see whether the eligibility issue would go to court. Some worried that if El-Sayed secures the party's nomination in August, he would be vulnerable to a Republican court challenge in the fall. Since the first report, Cobbs told Bridge he was “watching the situation play out,” while Thanedar said “this is not really an issue for us” and he didn’t view El-Sayed as a threat. Whitmer’s campaign released a statement Thursday calling for a debate about the issues. "We take Dr. El-Sayed at his word and the campaign will not be challenging anyone’s eligibility. This sideline chatter continues to distract from the conversations that actually matter to Michigan families — how we fix our roads, grow our economy, and protect health care,” spokeswoman Annie Ellison said. So Michigan democrats are calling for the Michigan Constitution to be ruled unconstitutional? That my read in all of this. A last ditch desperation tactic, which I honestly expected better from him..
No one is calling into question where he was born. They are correctly citing the undeniable fact that he lived in New York until recently and pointed out by his New York drivers license and voter registration...which I presume he at least took the time to read before signing. If he cannot be bothered to do something so basic, running for something far more involved like governor (or even winning) will be too great a challenge for him and will in no way benefit our state. "A last ditch desperation tactic, which I honestly expected better from him"?? Come now. What do U expect from a democrat? A leopard can't change his spots. It's genetics. It is bred right in them. It is pretty clear to me that he is not eligible to run for Michigan Governor until after 2019. In seminars detailing where do you really live, actions such as obtaining a driver's license or registering to vote are elements of being a citizen of a state. I would also assume that if he was working in New York, he paid taxes to New York, and probably listed his New York address on his federal tax form. These are additional elements to proving he was a citizen of New York. Having voter registration in two states does not make him a resident of two states. Exercising voting privileges in two states would make him a felon, but there does not seem to be a record of dual voting. Showing us the federal tax forms for tax year 2014 and 2015 seems to be the simplest way to show which state he considered himself to be a resident of at that time. Selective application? That's news to me. What former Michigan governors were actually ineligible for the position at the time of their election? I'm interested in your documentation here. Legit or not? Oh, right, the LAW apparently doesn't apply to this candidate. That's the only selective application I'm seeing here. The amount of BS being shoveled by Dr. El-Sayed and his camp is career politician deflection worthy. Get the eligibility question resolved and quit whining about it. I haven't made a decision on who I'm supporting in the gubernatorial race and it's quite likely that when I do that Dr. El-Sayed will not be my preferred candidate, but his handling of this issue leads me to question if I should even consider him ... now or in the future. The defiant, non-transparent, laws-don't-apply-here approach taken by Dr. El-Sayed and his supporters could (and rightly should) be a career killer for him in Michigan. If you wish to be taken seriously, Dr. El-Sayed, then start taking the laws of the State and the legitimate concerns of the electorate seriously. There is no absolutely legal "expertise" required in this situation whatsoever, only the ability to read. This also leads back to an earlier comment that I made on this issue being more wide spread regarding qualification for the office than the media and other politicians would like to acknowledge. Dr. El-Sayed knew of those qualifications before announcing his candidacy, or at very least should've taken the time to learn them. He rolled the dice on this one hoping that either people wouldn't be paying attention and/or wouldn't speak up about it, regardless of how charismatic of a speaker he is. Bottom line: We are a nation of laws. And if any candidate thinks that those laws don't apply to them, is that not "selective application" of those very same laws? Question is did he ever vote in Mi? How and when did he all vote elsewhere? And how can you register in Mi without Mi license or did he update at same time to Mi license? R U surprised that a self professed progressive democrat would lie or cheat to get elected? It's in their (democrat) DNA to be corrupt. Just look at Hillary &/or BHO. Now comes this guy that wants MI to look like all other S*ithole states (NY, CA, etc). He's just another narcissistic nobody trying to B somebody. Go back to NY and live in your progressive utopian hellhole. It is clear that the only way to settle the eligibility issue is by taking the issue to court. If Dr. El-Sayed is unwilling to do that, can an ordinary citizen such as myself hire one of the election law specialists to take it to court? Does it require legal standing? My main complaint is that people are being asked to donate money to a campaign that hasn't filed the paperwork with the Secretary of State and may not survive a legal challenge.